Interior Minister Eli Yishai, Minister of Strategic Affairs Moshe Ya'alon, Minister of Information Yuli Edelstein and Science and Technology Minister Daniel Hershkowitz toured illegal West Bank outposts Monday, at the invitation of the Shomron Regional Council. The ministers, traveling under heavy security, visited the outposts of Nofei Nehemia and Bruchin, both of which are awaiting the necessary zoning permits to become legal settlements, as well as Havat Gilad. The latter, according to its residents, was built on land purchased by Moshe Zar. This was the first ministerial visit of its kind to the area since the 2005 disengagement. Gershon Mesika, head of the Shomron Regional Council, Yesha Council Chairman Pinchas Wallerstein, Zeev Hever of the Amana settlement movement and others representing the area's settlements, accompanied the ministers on their tour, which according to Yishai, was not one to illegal outposts but "to legal settlements built by the governments of Israel." "Today, even those who supported the pullout realize it was a mistake," said Yishai, adding that he hoped Prime Minister Benjamin Netanyahu would at least be able to explain the importance of settlement blocs to the US administration." Upon arriving in Bruchin, Hever told the ministers that "over the last few months, we've been given only one answer – illegal construction or places lacking zoning permits are doomed to be torn down. "Today, the High Court says we have to set dates for (consensual) eviction," he added. "Unless the State changes its court brief many of the communities lacking zoning permits will be condemned. You have to intervene and change this thing." Minister Ya'alon promised to present the case to Prime Minister Netanyahu and Defense Minister Ehud Barak. "The Gaza pullout gave Islamic Jihad a tail wind. 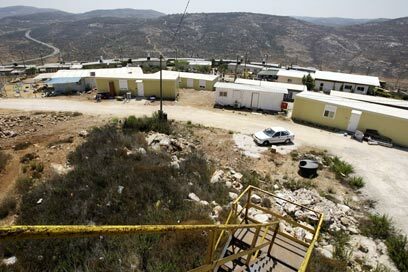 Withdrawals bolster terror," added Ya'alon, when the ministers arrived at the now evicted outpost of Homesh. "There is no doubt that this place has strategic significance." Minister Edelstein added that "the mistake made in Homesh can still be rectified. It's not irreversible. Once we get passed that first hurdle of freezing settlement construction with the international community, we will deal with Homesh." "Uprooting Homesh and the Gush Katif communities was a foolish act," concluded Minister Hershkowitz. Wallerstein expressed hope that the visit would mark a shift in the government's policy regarding West Bank settlements. "A four-minister tour in Judea and Samaria is a first," he said. The visit followed recent right-wing allegations of "political, legal and governmental persecution" against the settlement movement, made over the cabinet's deliberations on halting settlement construction and evicting illegal West Bank outposts. Shomron Regional Council Head Gershon Mesika complained about the fact that "radical elements in the Left have turned the matter (of settlements) from a political issue to a legal one." Yesha Human Rights Organization Chairperson Orit Struck added that "it's no secret that the demolition of outposts represents nothing but selective law enforcement. "Any other community with the same status as the outposts on the other side of the Green Line – especially Arab communities – would enjoy what former Minister Shlomo Ben-Ami called 'wise enforcement' and affirmative action." Peace Now Director Yariv Oppenheimer released a statement following the ministers' visit: "Erecting West Bank outpost is just as grave as the bribery scandal that Shlomo Benizri was convicted of, but evidently, Shas' chairman does not think the law applies to his political or ideological associates, who apparently deserve only immunity and clemency." See all talkbacks "Yishai says outposts not illegal "